Covering an area of 3000 acres this is one of the biggest lakes in Haryana. 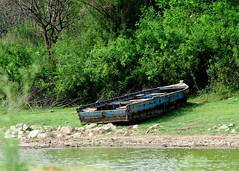 The lake is about 60 KM from Delhi, on the outskirts of Gurgaon. 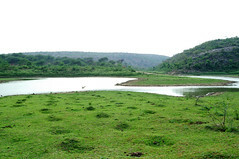 It is a picnic spot but there are places to stay nearby and can be considered a mini vacation spot as well. During the winter months you can find some migratory birds making their way to this lake, but don't expect to see many exotic birds as there is a lot of human activity in and around the lake. One section of the lake is always bustling with activity. There are merry-go-rounds, rides and boating. If that were not enough you can take your own picnic basket and you'll have more than enough to make a good family outing. The place as a very rustic feel to it and one can experience a slice of village life with the comforts of modern day city life. If you are the adventure seeking type you can always go on a trek in the surrounding hills. Or if you prefer to have some peace and quite, take a stroll along the lake and once you get past the small heads of cattle you can find a quite spot along the lake all to yourself. If you fancy you can simply lye down on the grass next to the lake and be filled with sounds nature, of birds chirping in the distance, the wind blowing though your hair and to top it all have a canapé of open skies. Getting here is a bit of bit painful especially if your vehicle does not have a good suspension. There are small sections of the road which are not smooth to say the least and in some case have a lot of pot holes. However, for the most part the drive is good and if you are one of those who enjoy twists and turns in the road you will enjoy the drive. Especially once you start looking out for those almost invisible speed breakers. Weather you looking for a short holiday or just a day outing this place is surely worth considering.